Player L can be quickly identified as the beloved Kosuke Fukodome. He’s still credited for walking 10% of the time, but it’s more like 7% in the last couple months. * I don’t know if everyone else talked about it and I was just to caught up in Playoff Fever, but last week’s mention of Angel Guzman’s surgery caught me by surprise. It’s not a national story as Prior and Wood have been, but it’s just as much a disappointment. Angel is now just another failed top level prospect whom the Cubs can not count on for next season and is unlikely to ever contribute. And unlike the other two, Angel’s never really gotten paid. It’s too bad. 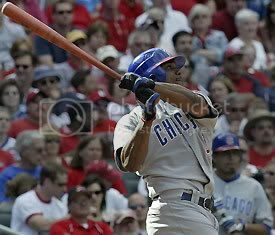 * As much Jacque deserves to be free from the torture rack that wearing the Cubs uniform was for him, Jones, Floyd and Monroe are taking some power with them and no one seems primed to replace them. The saving grace is those three were not adding much power last year and may not add it to their new teams next year. It’s still a hole that needs to be filled. Maybe Soto or Pie can step up, but this has to be in mind when the new outfielders are strong. * ESPNZone charged us ten dollars per person per hour to watch football on Sunday. Never watch football at ESPNZone. Go to a local sports bar. Might be good for other stuff. * One more call to make tomorrow. It’s the day before Thanksgiving, so I think I’ve passed thru. Now I just need my car. – Jacque’s first interview mentioning how much he hated being in Chicago will take – 24 hours? 48 hours? – Omar Infante? Really? ehhhh. – I guess the Tigers are trying to beat the Christmas rush! – Project Make Felix Pie Stop Sucking is actually far more interesting. When Rocky Cherry came in and gave up those 2 runs, I didn’t think much of it because it didn’t look like the Cubs had the offense to come back this game. Looking back at it, those 2 runs and Aroyo being able to last 7 2/3rds were the turning points of the game, even if the collision was cooler to watch. In the limited time the Cubs saw the Reds bullpen, they didn’t have much to offer, and obviously if Rocky doesn’t give up those two runs, it’s 4-2 game in the of the 9th and Howry never pitches. There were some things that could’ve been better played. I was annoyed to see Dempster not come in the 9th, but not really surprised. It would’ve been better if Lou had done a double switch when Marmol came in (he bats 2nd, Cedeno bats 9th and takes over SS), but I guess they wanted to the freedom to pinch hit with whomever if the pitcher’s spot came up, and who knows if Ronny would’ve gotten a hit there. Just to make it clear, I was cheering when Kendall got that hit. I don’t think Jones purposefully slowed down at any time, I think they made the right move to send him, and that was a heck of a collision. I think Murton’s probably got a day or two to prove something, before they look to trade for someone to fill the Ward spot. I don’t know if it’s Wigginton or Connie or whoever, but I suspect a small deal on Monday or Tuesday. Does this count as being late if I write before I SEE the next game? It’s just starting, tape delayed on my TiVo right now. I won’t spoil it for you – but I have to pause it because they’re showing my the defense lineup and it’s, uh, distracting. So what we learned Thursday is there’s apparently no safe time to have D Lee out for five games. As soon as we think the Cubs have everything lined up and are even opening up a nice spot for Ward to get some much deserved ABs, all heck breaks loose. The Cubs do not win this game if they do not have people capable of playing in numerous positions; I think most teams are hurting a lot more when they’re quickly down two 1B and a corner outfielder. This game really should’ve been a blowout like some previously, but the Cubs pitchers were stuck on the gopher ball. It’s a bad thing to have the one big weakness being home runs. That’s clearly the biggest problem for this team, more so then walks issue (which usually is it.) It’s just good that they’ve cut down the number of games where everything goes to heck from the first couple months of the season, and that everyone on the offense is hitting. It seems like Bonds isn’t done, he’s a force of nature a lot less frequently. So glad to say goodbye to him and the talk. Jacque needs about three more weeks of hitting like this for the Cubs to get anything worthwhile out of him in trade. Of course, once he did that, no one would want to give up on him. If these Cubs are going All The Way, I sure hope he gets a few more games like this, so he’s not booed at the victory parade or something. You can argue Soriano or Ram ahead of him, but when is the next time Jacque is going to get 4 hits. The White Sox are an awful team. Something’s off. Weird how he takes so many more walks with men on; if you factor out the IBB, it’s 300, but he’s still walking twice as often. The power is none existent with men on. Perhaps we DO want Soriano leading off! For his career, Soriano loses 22 points off his average and 66 off slugging with men on, but the different in on base is tiny compared this year. It’s a thing with him. How did Ryan Dempster hurt his oblique? We’ve never found out, and it seems a bit important. If Mamrol wasn’t hot and Howry wasn’t solid, they’d be in trouble right now. Well, as much as trouble as team already 7.5 games out could be. After hearing so much about it, I’m kinda sad I missed Hawk losing his mind about the obstruction call and being totally incorrect about it the whole way. WGN totally kicked Comcast on production for this play and this game, and it wasn’t close. They’re the real winners here. Stalled out on writing this, because it sure sounds like a move is coming down today, and there’s gotta be a 5% chance it’ll be JJ day. Lou wants to add another pitcher. Ward, Fontenot, Pagan and whichever is the backup catcher today aren’t going down. That leaves Jacque and the Riot, and while it makes sense to send down the guy who’s 0 for his last 19, it’d be an awful lefthanded bench. Even though there’s potential to be a firestorm is Ryan goes down while Jacque stays, I think sending down Theriot is the right move. Releasing Jacque while still paying all of his salary for the 1 2/3rd more seasons for nothing isn’t the right move. Just not certian they’ll make it.